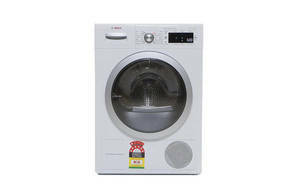 Snapshot: The Bosch WTW87565AU heat pump dryer can dry up to 9kg of washing at one time. But how does it rate? Has sensor and timer drying. Reasonably-priced (for a heat-pump dryer). Energy efficiency (50%) - calculated from the amount of energy used to dry 1kg of wet clothes. Drying time (50%) - based on the time it takes to dry 1kg of wet clothes.